Too tired to write. Falling asleep at keyboard. Catching up on pics from the last few days. 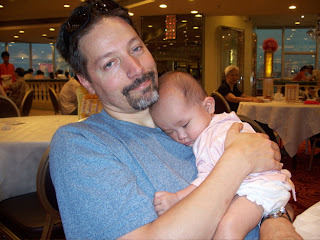 Here's Matt and Juna at a local Chinese restaurant in downtown GZ. Yes, we took a cab and went downtown. The only Americans around. We attracted a lot of attention. Coco, Juna, and Samster. Internet friends meet. 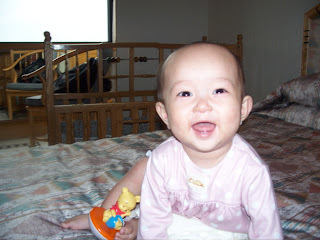 A happy baby especially loves the song, "Shoo fly, don't bother me." 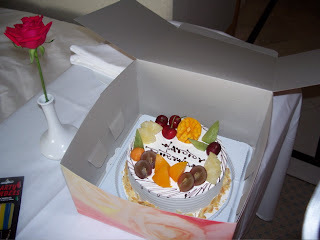 A birthday cake sent to our room courtesy of our adoption agency. More when I can focus my eyes again. Now we need to see a picture of you, the rev and juna! I think it is great that you adventure out in the cabs and streets like you do. And how cool is that to finally meet your chat buddies in person. 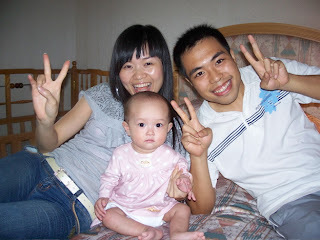 I've read lots and lots of "going to China to adopt" blogs. I have to say, your experience of getting out and seeing the "real China" away from the tourist crowds and the air conditioned hotel lobbies is RARE!! Congratulations for just jumping into the mix. HI! Just got home - we were out of town all weekend. I was having blog withdrawls. I almost posted before I left to let you know I'd be gone all weekend and realized that was really dumb. I don't believe it would have effected you all the way over there! But I'm telling you - that is how addicted to your hearing about your trip I have become. Living vicariously through you! So sorry to hear you got sick! But happy you got a new room. And YES the rugs are filthy. Gross huh? That is great news about the finding ad. I had Sofie on my lap when I read that. Made my eyes water. I agree about the stress - not easy to travel across the world to meet your new daughter. At least youe are so busy and overwhelmed while in CHina that you don't have too much time to think about it - at least that was how it was for me. I thnk it started to catch up with me on the ride home. Which was a trip in itself. Everytime we landed and one leg of the journey was over I'd think that Sofie was a bit closer to home for the first time. It killed me. I had tears running down my face all the way from Chicago to St. Louis. I laughed so hard when I read the Barbie bit. Only in China huh? But, hello - Mattel? Good night nurse. Have you ever? The baby is wearing lipstick - you're right. Unbelievable. And yes - I also wondered about the hoochie baby outfit and Barbie's shoes. I wondered how she did all the walking in those platforms. The part about the weight requirement had me rolling. So cool you got to meet your buddies. I bet that was awesome. We tried the fish and chips at Lucy's - pretty good. Also the Cow and the Bridge was good. I tried to order Sofie sorbet at the Cow and Bridge but they would not let her have it - so they never brought it to the table. "Too cold for baby." AND I liked this one shop - something in the name to do with folk art? It is on the way to the Cow and the Bridge from the WS. Their stuff was a little higher quality. I got a really cool table runner there and cool photo album. Not much dim sum at the WS breakfast but man - what was there was good. I had the shrimp ones every morning. YUM. A few blocks away there is a school and we would watch the students all do their exercises late morning - pretty neat. Not too far from Starbucks and the little park with the play ground. We also took a cab to an area like times square sort of and shopped and walked the streets. Ended up in the sewing notion district - a bunch of buttons, ribbon, etc for blocks and blocks. The cake is darling. Were you able to give Lina that note by the way? We really liked her sense of humor and laid back attitude. Sounds like things have been a little crazy! I imagine you will have a farewell dinner. The food was good and the beer was awesome - they just kept pouring! There was sweet and sour chicken and some guy in our group was calling them chicken McNuggets. The horrors. Oh heck Sofie is callin "mama!" really loudly. Better go!!!!!! Cant wait to talk!